1. Preheat the oven to 180°C. 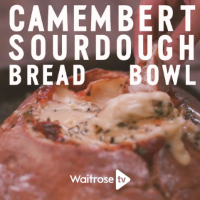 Slice the top off the sourdough loaf and, using the Camembert as a template, cut out a hole in the centre of the loaf, scooping out some of the middle but not cutting all the way through. 2. Spread the chutney around the inside of the cut hole in the bread. 3. Slice the top off the Camembert, then place it inside the hole. Scatter over the garlic and rosemary, then drizzle with the olive oil. 4. Bake for 30 minutes, until the cheese is melted.